I can't believe another summer is behind us. I hope you all had a great one, and I look forward to seeing new and familiar faces - and marveling at how much all the kids grew over the summer - when we head back next Tuesday! I thought I would give you a heads-up on some of the things coming up early in the school year. Firstly, a warm welcome to our new principal, Marla Margetts! We look forward to working as a team for our wonderful school. Secondly, a HUGE thank-you to the many volunteers who made last year so successful! From Dianne Ewing being our childcare champion so folks can come to the PAC meetings, to Brianna Perry heading up the Scholastic Book Fair to countless others, y’all rock. Our first PAC meeting will be September 14. This will be an important one, as we will be doing elections. Vacant positions include secretary, vice-chair, and, yes, chair. This will be my 6th year with the PAC and 4th on the executive and I need to step back and focus on other things – though I am still very committed to following through on the playground project regardless of whether I am on the executive. Do not worry, if you choose to step up, you will be supported immensely. At the least, I am looking for someone to partner with in the chair position. It would be a great way to pass the torch and share knowledge for a smooth transition. We invite your energy and ideas and urge you to join us in any way you can - PAC meetings always include free childcare. 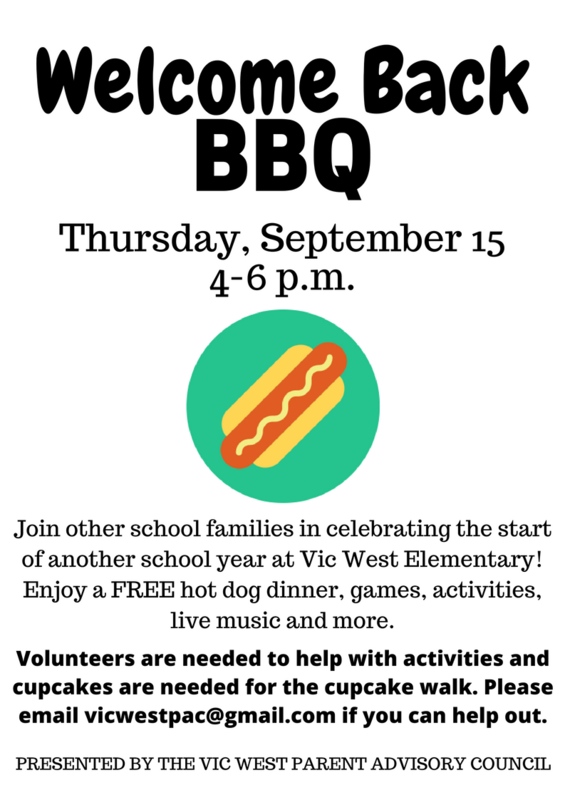 The Welcome Back BBQ will take place September 15 from 4 to 6 p.m. - we will need volunteers to help make the event a success and will be in touch with details! Save the date! Again, please consider getting involved in whatever way you can, or contacting me (vicwestpac@gmail.com) if you would like more information regarding the duties of the chair or other executive position. It does not have to be a huge time commitment, but together we can keep offering the school beneficial events like you’ll see in this document - A Year in the Life of the Vic West PAC - which outlines our many activities in 2015/2016. In the meantime, I look forward to working together to make another successful and memorable school year!